Thin and Curvy: Is Banana Republic's new Mad Men line curve-friendly? Is Banana Republic's new Mad Men line curve-friendly? Ever since the announcement that Banana Republic would be offering a special, early 1960's style collection inspired by the TV show Mad Men, I think every curvy lady has been wondering, "will it be curve friendly?" I'm wearing a size 4 in this photo. 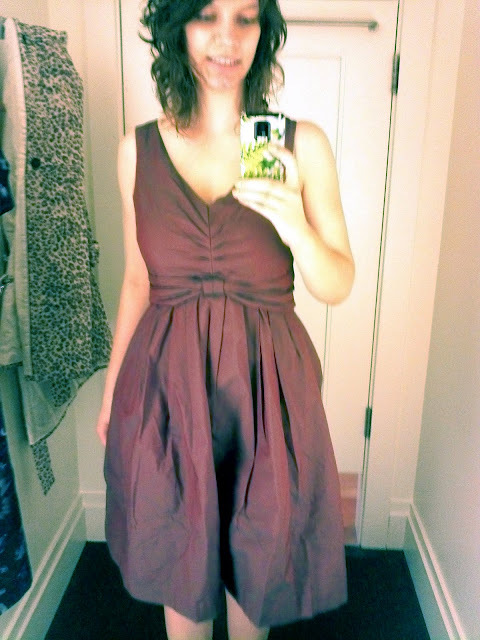 It fit pretty well, but then a sales lady handed me a skinny belt which cinched in the waist the rest of the way in without ruining the look of the dress and gave it a really nice look and fit! 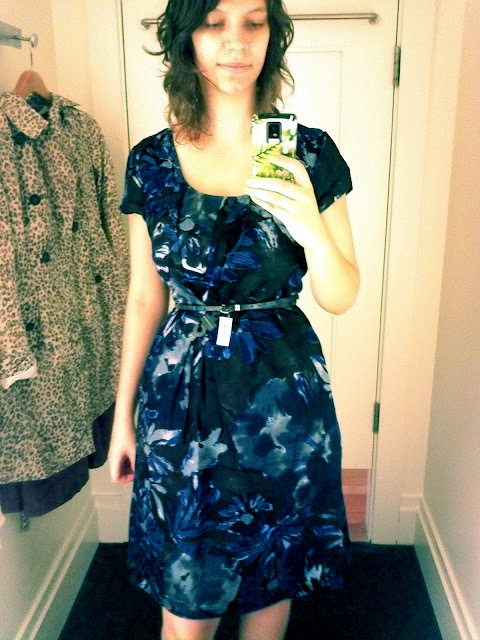 I quite liked this dress and may go back and get it at some point. Ummm... need I say more? Since it was the smallest size they had under like a 12, I optimistically went for my 'waist size'... 0. Surprise! It actually fit! Unlike the blue begonia dress it had a little bit of stretch, but it was still very tailored feeling. The lining was super super soft. I have wanted a dress like this for... oh I don't know... years. The perfect lace little white dress. I even bought one like it from Bravissimo a while back on eBay, before I knew how badly they would fit me, but of course it looked awful. But this was really nice. I have seen enough fashion bloggers style their own to know it would be endlessly versatile whilst being soft, summery, and feminine. It flattened me out a little bit from the side, but not too bad and I think a different bra would help with that. I will definitely be getting this one! Ok, totally not my style. but I know some of you will love it and with the belt to cinch it in at the waist, it's a pretty good fit. I thought this pretty silk dark blue shirt was part of the collection when I grabbed it, but as you can see, epic fail as that's as far as it would button. It was also too big for my waist, despite being a size 0. Sigh. But I really liked this pretty black skirt. Very professional looking but also curvy bum friendly. (also size 0 and a great fit at the waist!) If this whole outfit could have fit me, I would have paired it with an artsy necklace and shoes and worn it to interviews or other times I wanted to look professional. It somehow felt very 'artist-dresses-up' and I liked that. Ok, 1) SOOOO not my color, ick. And 2) massive at the waist. The second photo shows it held in. What do you think? Will you be trying any of the pieces from the collection? I love Mad Men and am currently rewatching the series (season 1-4 available on Netflix Instant! ), but I feel that as a poor college student, I might have better luck finding 60s-style clothing in thrift stores. However, given the popularity of the show, I'm sure the line will be a success. And it's good to know it fits curvy girls--at least in some cases. I really like that Lace dress and Cheetah print coat. Great article! It looks like it's doing marginally better than the normal high street but hey, a step in the right direction! I LOVE the lace dress, looks lovely on you! They look great! (well most of them anyway...) I don't have the money to buy any of it now, though. 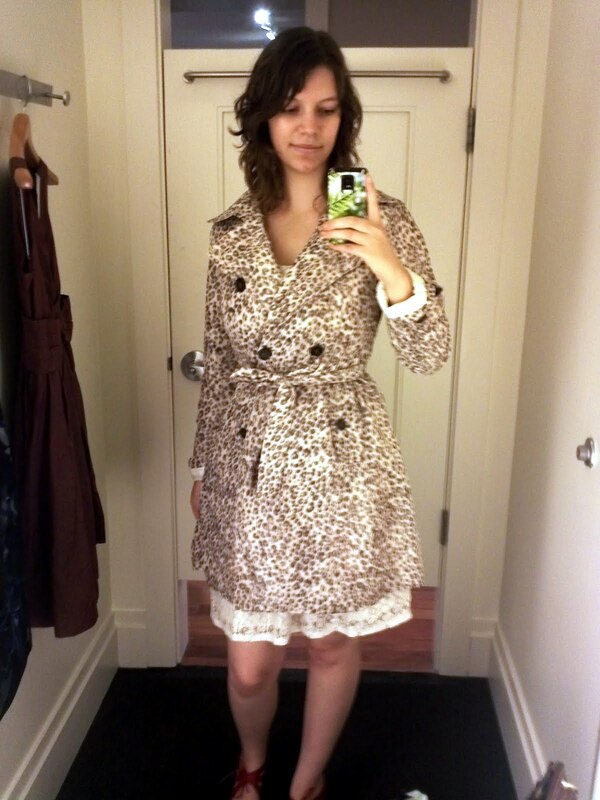 Sarah, if you have a Banana Republic outlet near you, you can wait for a while and check there; you could also try to find a vintage or vintage-styled pattern and make it (if you have any sewing skills). SOOOO happy you reviewed this. Must get the white lace dress. I've always adored that style, too. Sophia, I totally agree w/ you re sleeves. Actually, I like you in the lace shell. So maybe you DO need to say more on this one . . . perhaps the photo isn't showing what you think it's showing? And it just dawned on me that the trench coat isn't necessarily Mad Men style, is it? It's more capitalizing on the trench coat that Christina Hendricks modeled for London Fog. Or is this a look from Mad Men? I've only watched a few episode. 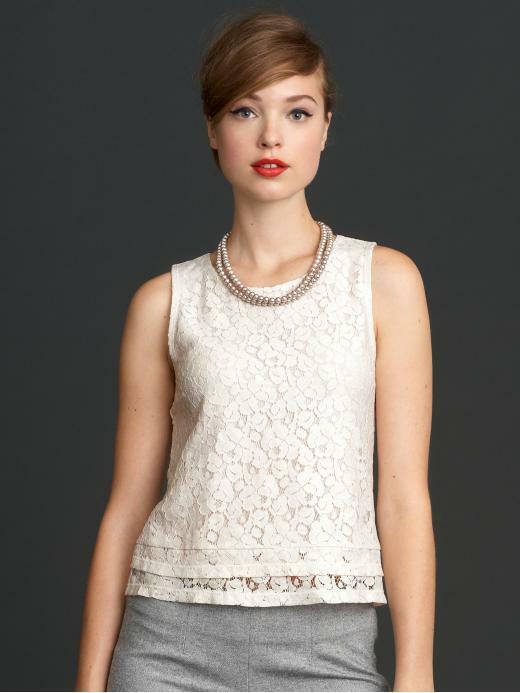 I was dress shopping today and stopped in at Banana Republic without knowing about this new collection. I saw a few beautiful vintage-style dresses, but they were all above my budget. I will have to stop in the BR outlet when I head to the outlet mall and see what they have! Not relating to the Mad Men line, but some exciting news, anyway. I think that the necessity of professional fitters and good stores is reaching to more people. I was the anonymous person that said a few posts ago that the nearest fitter to me is 3 hours away. My husband told me today that there's a boutique that specializes in "non-average" sizes (28AA-44KK) that is having a soft opening right now, grand opening on Saturday! So I will finally have my first professional fitting on Thursday. Not only will I have bras that fit me, but I'll also be supporting my little town's local economy! I think all of these outfits would have looked better with a different bra. They are going for a much more structured look, harkening back to the high, pointed, conical breast that was fashionable in the era in which "Mad Men" is set. Yes, it is somewhat modified for modern looks, but the tops are all obviously cut for a more high, structured silhouette. The bra you are wearing here doesn't seem to give much lift. I also think the shell looks good. Not the same fit as on the model, but still nice. Again, it would look better with a different bra. I have tried on several pieces of the Mad Men collection. I'm 5'9", 140, 30F, and I usually wear a 6 at Banana. The blue Begonia dress looks amazing on me. I think the size 4 might be just too big and/or too short for you — mine is a 6 Tall, and it's pretty much perfect (you're tall as well, right?). I tried the standard 4 and 6 as well, and while they were both passable, the Tall size really put all of the curves in the right places for me.I added a skinny belt to give the waist a bit more cinch, and it's perfect. I think it also helps if you are quite short waisted (which I am). 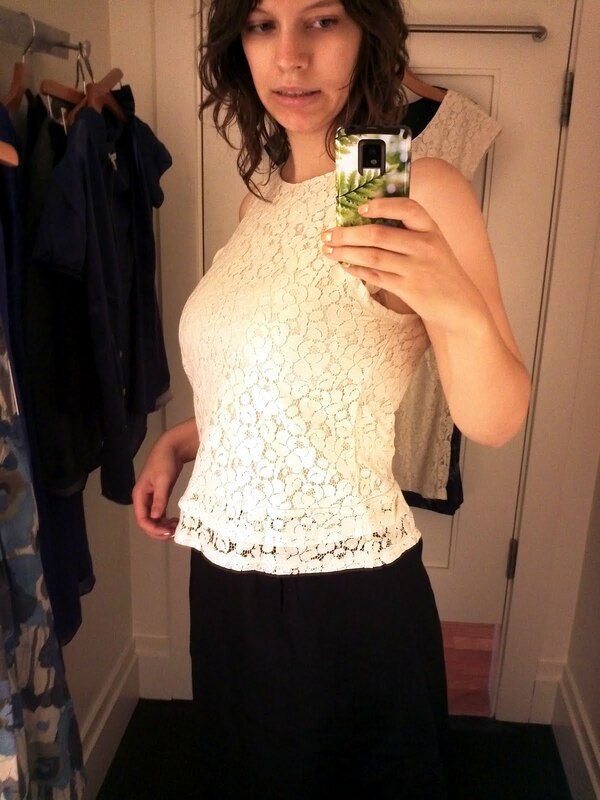 I also tried on the lace dress — very curve friendly, but unfortunately too short for me (I am old and don't wear things above the knee). I also kept the full skirt, which is super cute. I agree with others on the sleeves - cap/short sleeves are not flattering and don't look "period" enough. Loved the pearls too - glad I got them in silver and pink because they no longer seem to have them online except in white - the clasp is very elegant! Great post - I love the lace dress! I'll need to keep an eye out for that. 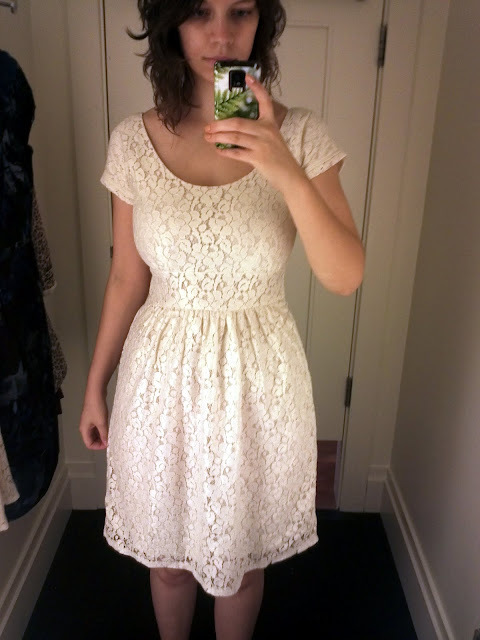 I've always wanted a lace dress, but never have found one that fits well. Thanks for sharing! I saw their line online and was considering getting a dress from it but it doesn't look like it'd be a good idea without actually being able to go to the store and try them on. I think I'll probably go the route of http://www.pinupgirlclothing.com/ instead. 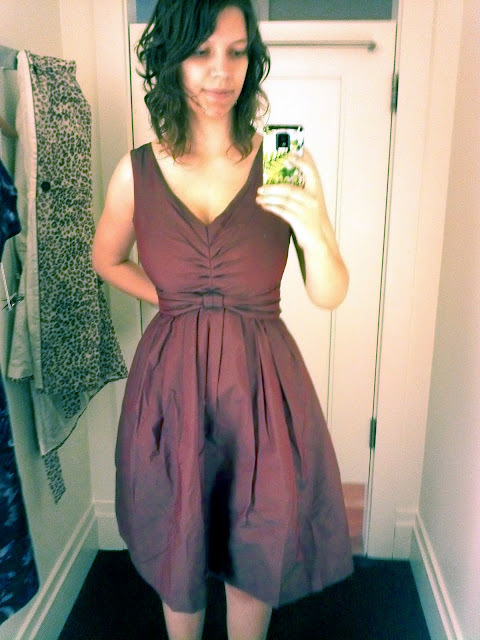 I really would love a nice fitting vintage-looking dress. That blue shirt looks absolutely incredible on you! Definitely keep that in the mix for date night! WOW!